I am a huge fan of Lucy from Attic24. She is a fellow Brit, has an amazing eye for combining just the right uplifting colors and has such a sweet voice on her blog. I have made two of her blankets: the neat ripple and the cosy which I am immensely pleased with. 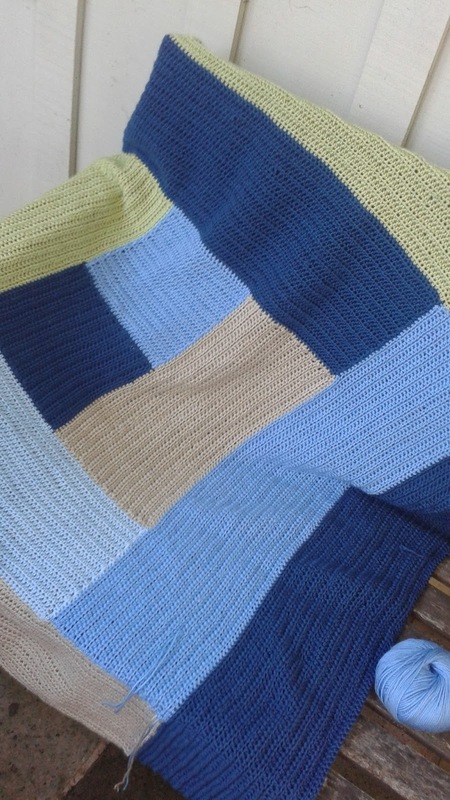 This summer I found "boyish" colors of Ella Rae in sufficient quantities in the sale bin at work so started her coast blanket for my son. However, the ripples were looking a little feminine and I'd been warned not to embarass him. (I fully intend for him to take this blanket to college). So a geometric design came to mind and because I am somewhat scarred by six months of joining charity blanket squares it has to be in the round. I didn't find a pattern I liked so I made it up as I went along. Was absolutely delighted to find out on Facebook this week that Lucy's next CAL (crochet along) will be a log cabin too. Of course it looks totally different from mine!! It's oh so cute, the colors are totally Lucy and there is a granny square flower in the middle. Gorgeous! I have just reread my published post on what I did and they make no sense whatsoever. I do apologize. Please just skip the next paragraph and carry on reading at "I may well...."
Squares: My starting square is 30 stitches wide by 24 hdc rows tall. Edging the square with single crochet: Once I finished a color I put hdc, 2 sc in the corner and carried on around the corner with one sc stitches per row for two rows then two sc in the third row so that I had an even 30 sc for my next color block. 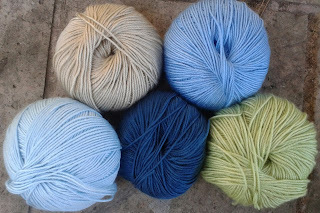 Then I rejoined the yarn to the opposite side and followed the same pattern one sc per row for two rows then two sc in the third row then 3 sc in the corner and sc all along the top. Joining the new color yarn: Once I got to the end I did 3 sc in the corner and then joined the new yarn color for a new block at right angles to the last. I started one stitch in and stopped one stitch from the end so that I had space for the edging to go all the way around. I may well get around to writing out the pattern properly once I figure out how I make it into a rectangle rather than a square but I'm one color block away from making a decision on that. I'm thinking seven block wide one block high rectangles at the moment above and below the main rotating pattern but will see what I think up! Here is the blanket so far. I am enjoy this so much and the hdc are extremely relaxing - an easy watching-TV-with-my-husband kind of project.